Wedding Requests must be submitted at least six months before the desired wedding date. Please contact the parish office at 208-342-3511 or [email protected] for possible openings. The calendar changes often; dates are only scheduled and confirmed once all documentation and non-refundable down payment are received AND the interested parties have met with the Pastoral Associate to discuss Cathedral dates and assign clergy. 2. Contact our Pastoral Associate at [email protected] to initiate the planning process and to plan for a priest or deacon to help you with marriage preparation. Make an appointment to meet with a pastoral staff member (either a Pastoral Associate or Deacon). This appointment will review the process of getting married in our church and the initial down payment of $375 will be due to confirm your date and time. If you cancel your wedding for any reason the down payment is non-refundable. What times are available for scheduling our wedding? NO weddings scheduled on Sundays, Christmas Eve, Holy Days of Obligation, during Lent or the Paschal Triduum, or other designated days. This fee includes the basic Wedding Music Fee with Dr. Ray Morvant. All extra musician fees will be charged separately. 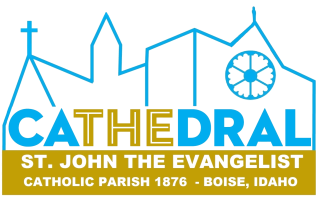 All checks can be made payable to St. John's Cathedral and sent or delivered to the parish office at 707 N. 8th St., Boise ID 83702.